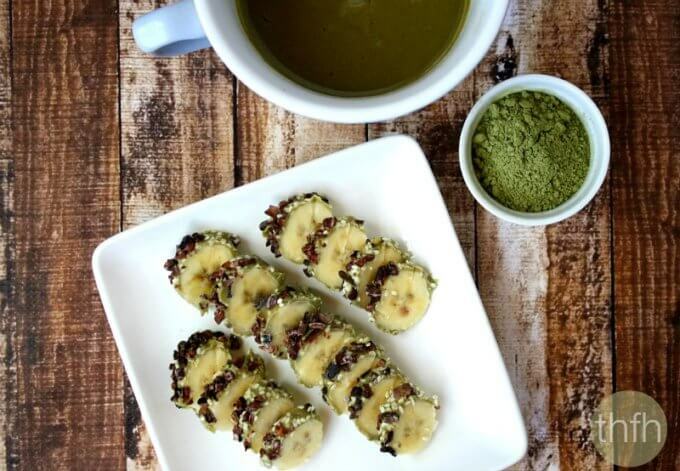 Today I have for you Banana Sushi with Sweet Tahini and Matcha Spread which is a quick and easy snack to make using healthy, clean ingredients. It’s my contribution for The Recipe ReDux theme for March which is “Two for One”. I had just happened to post my Sweet Tahini with Matcha Spread recipe earlier in the week and promised a couple of recipe ideas of what to use it with, so I thought this would be a perfect opportunity to share one of those with you. 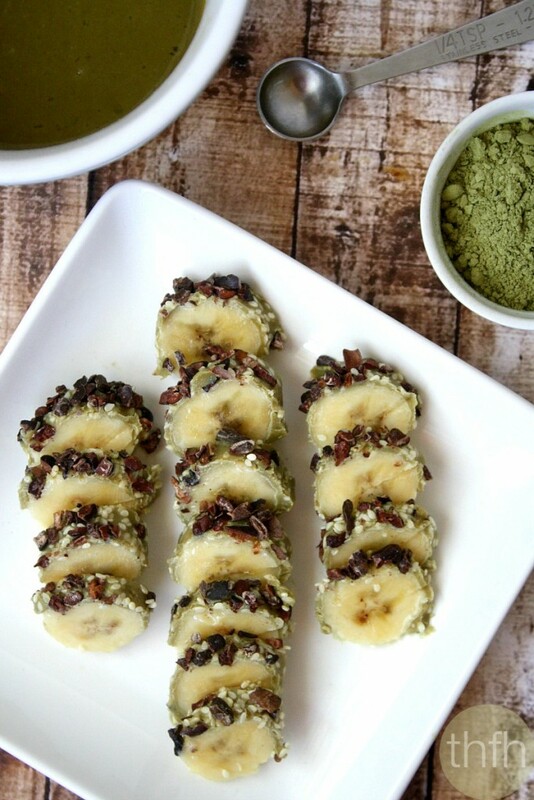 You may remember my original Banana and Hemp Seed Sushi recipe I posted a while back that is still one my boy’s favorite snacks. Well, this is more of a grown-up version! It’s a frozen banana topped with my Sweet Tahini and Matcha Spread, then sprinkled with raw cacao nibs and sesame seeds. It’s super easy to make, uses clean ingredients and it’s “almost” raw, vegan, gluten-free, dairy-free, paleo-friendly and contains no refined sugars! Tip #2: I added raw cacao nibs and sesame seeds on top of mine, but feel free to add your favorite toppings. Tip #3: Fresh bananas work best because they will be firmer and make it easier to decorate. Tip #4: It’s easier to decorate the banana and freeze it in one solid piece and then cut it into slices before eating. I pre-cut mine and then froze them to take the photo, and they work this way too, but you could do it either way. Step 1 Peel the banana (fresh is best) and put it on your plate or saucer. Drizzle the Sweet Tahini and Matcha Spread over the top, covering the top completely. Sprinkle with organic raw cacao nibs and sesame seeds (or your preferred toppings). Put the decorated banana in the freezer for approximately 30 minutes, or until it is frozen. Remove from the freezer and cut into slices before serving. Best eaten when it's frozen, rather than thawed. The recipe and photographs for "Banana Sushi with Sweet Tahini and Matcha Spread" by Karielyn Tillman of The Healthy Family and Home are licensed under a Creative Commons Attribution-NonCommercial 4.0 International License and cannot be used without my written permission. Step 1 Add all ingredients to a small bowl and stir until well blended. You will need to let it sit out at room temperature or sit it in a bowl of warm water to soften it (due to the coconut oil) before using. This recipe will make approximately 3/4 cup. 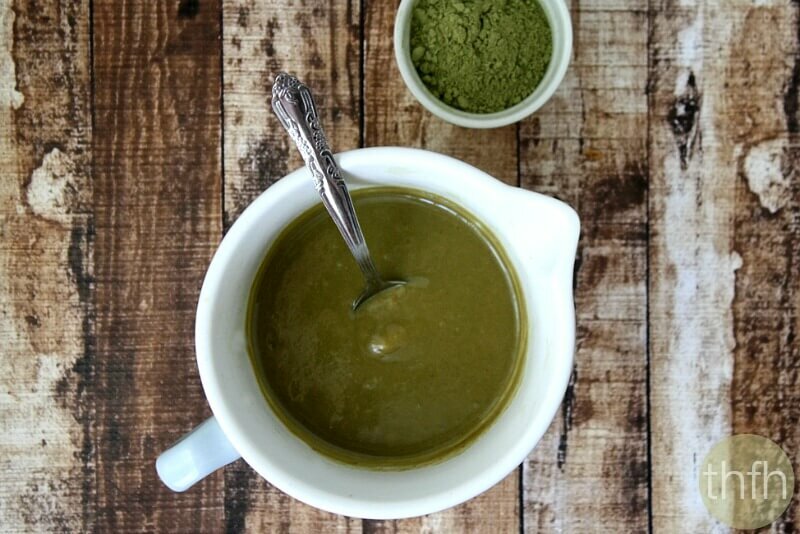 The recipe and photographs for "Sweet Tahini and Matcha Spread" by Karielyn Tillman of The Healthy Family and Home are licensed under a Creative Commons Attribution-NonCommercial 4.0 International License and cannot be used without my written permission. 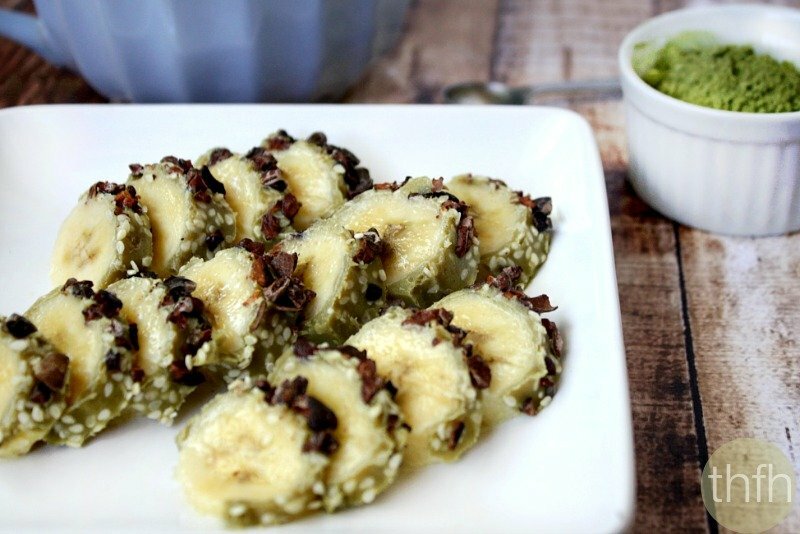 I love all sorts of banana snacks, especially frozen banana slices 🙂 this looks delicious! I now know what to do with that lonely jar of tahini sitting in my fridge. THANK YOU! This looks super awesome! Hi there Kat! I’m glad you will have something new to try with your tahini! I normally only grab mine when I’m making hummus so this is a nice change.